Fatima May 13, 1982 — What Actually Happened? Was Russia Consecrated to the Immaculate Heart of Mary? In order to understand what has happened, it is necessary to know that Lucia is not authorized to speak about the happenings concerning Fatima without the permission of the Holy See. 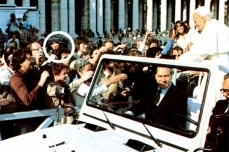 Now, in the days after May 13, 1982, several people sought to be received by Lucia in order that they might know precisely what to make of the act of consecration to the Immaculate Heart of Mary effected on that day (i.e. May 13, 1982) by Pope John Paul II. In particular, a Brazilian advocate, the Blue Army Representative for Brazil, presented himself at noon one day at the Carmel at Fatima where Lucia still was before returning to the Carmel at Coimbra. Poor Lucia, having no authorization to speak concerning the essentials of the matter, could do no more than make some trite observations that would sound encouraging, appeasing and hopeful. But the Brazilian advocate believed that from these observations it was possible for him to infer that a statement based on what she said could be broadcast worldwide. In effect, his text was reproduced almost everywhere, misleading opinion everywhere. 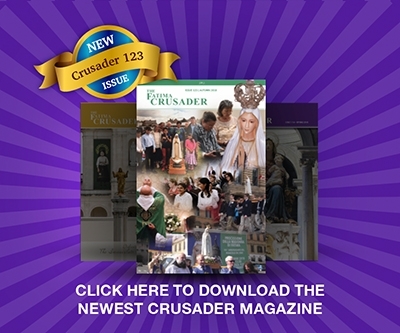 Concerning what must be thought of the act of consecration effected by Pope John Paul II on May 13, 1982, we can here produce two hitherto unpublished items of information. 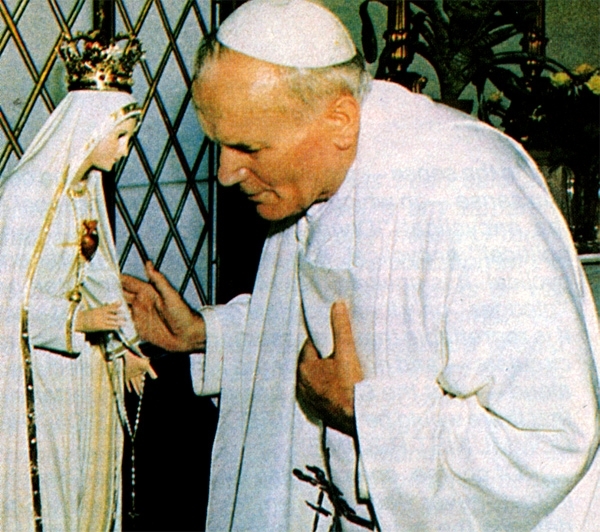 In March 1982, Pope John Paul II wanted to know precisely what he should do on the occasion of his pilgrimage to Fatima. We now know that the Lisbon Nuncio went to see Lucia in her Coimbra Carmel. This historic interview which took place during the afternoon of Sunday, March 21, 1982 lasted for two hours. On the one side of the grill there was Lucia; on the other side there was the Lisbon Nuncio, the Bishop of Leiria (the diocese which includes Fatima) and Dr. Lacerda. Lucia explained that the Pope must select a date on which to order the bishops of the whole world to arrange for a public solemn act of reparation and of consecration of Russia to the Most Sacred Hearts of Jesus and Mary, each in his own cathedral and at the same time as the act of consecration effected by the Pope. We do not know why this so precise programme could not have been realized on May 13, 1982. But we do know nevertheless that in the text which was sent to the Holy Father by diplomatic bag, it was not spelled out that each bishop must, each in his own cathedral, and on the same day as the Pope, arrange for a solemn public ceremony of the consecration of Russia. The Lisbon Nuncio informed Dr. Lacerda of this. A second historic interview also took place. This whole question of the consecration of Russia to be made by the Pope in union with the Bishops is governed by two texts written by Lucia a long time ago, and concerning which she did no more than comment this year. Lucia gave this text to her confessor, the Portuguese Jesuit Father Goncalves on May 29, 1930. As Father Goncalves posed still further questions, Lucia gave him another text a fortnight later on June 12, 1930, along exactly the same lines. As for the Bishop of Leiria, Mgr. da Silva, he decided to write to Pius XI in March 1937 reproducing exactly what she had said. This text is therefore beyond all doubt. Pius XI was therefore informed in 1937 of the duty of effecting the collegial consecration of Russia. He did not do so. And we have had corpses in tens of millions. • and that this consecration should be made by all the bishops of the world, on the same day, each bishop doing so in his own cathedral in a solemn public ceremony. It is known that Pope John Paul II wept when he read these lines when they were shown to him after the attempt on his life. We know also that today he has decided to obtain and to accomplish this consecration of Russia, as soon as he can, for he now knows the consecration made on May 13, 1982 does not comply with the demands of Our Lady. 1988 will be the millennium of the baptism of Russia. In effect, it was in 988 that Prince Vladimir had the Russian people baptized in the waters of the Dnieper at Kiev. The Russian Church prepares officially to celebrate this millennium. Will the occasion not be favorable? No one, either in the world or in Russia, could be surprised that the Holy Father would rejoice in celebrating the millennium of the baptism of Russia. Perhaps, the Holy Father could be inspired by what was done by Leo XIII in 1899. In the encyclical Annum Sacrum of May 25, he warned the Bishops of the entire world that on the following June 11, he would consecrate the world to the Sacred Heart, demanding that they unite themselves with him in this act. 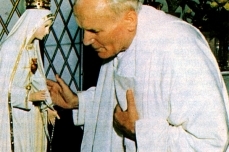 In the same way, the Holy Father John Paul II could by a short encyclical warn the Bishops of the entire world that he intends on such and such a day to consecrate Russia to the Most Sacred Hearts of Jesus and Mary and, since this event concerns the whole of mankind, that he is ordering the bishops of the entire world to join with him in his act by arranging on the same day each in his own cathedral for a solemn public ceremony of the consecration of Russia. That would be the final solution of the Russian problem…! If the Holy Father did that as soon as possible, he could in 1988 present himself on the banks of the Dnieper at Kiev, where the statue of St. Vladimir — a colossal and monumental affair — has never been destroyed by the Communists. 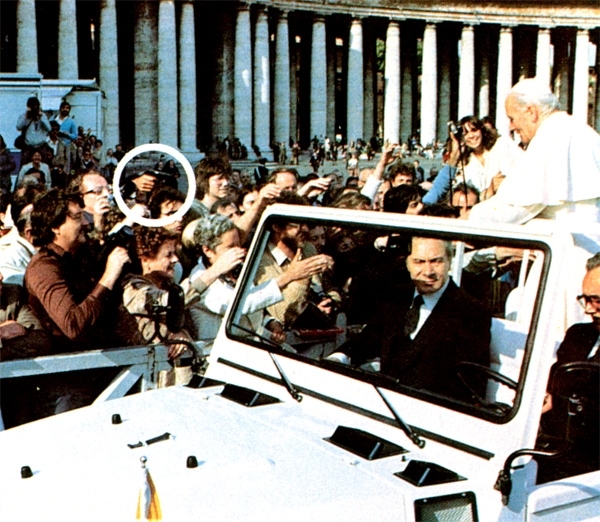 In the Bull of January 6, 1983, announcing the Holy Year, one has the impression that the Pope was inspired by what Lucia said to the Lisbon Nuncio in the historic interview of Sunday, March 21, 1982. Certainly, there was still no question there of ordering the Bishops to do something. The Holy Father only said ‘could be’. There is still no question there of consecrating Russia certainly; it was a case of something much more simple: asking pardon for our sins. However, perhaps that is how we move towards the final solution of the Russian problem. For Hitler, the final solution of the Jewish problem was to make them go to the gas chamber. For Our Lady, the final solution of the Russian problem is to consecrate Russia to the Most Sacred Hearts of Jesus and Mary. It is much more gentle.